Panama Canal Bead Cruise - Explore the world one bead at a time! Only 24 spaces available . . . 6 spaces reserved already! We are travelling EAST TO WEST this time! This time we GAIN time as we travel through the canal versus losing it! Only one sailing is going East to West. Different stops from the last bead cruise, three new ports so if you came along last time, you will have new locations to explore this time! Get away from the cold and rain, travel to where it's warm! Booking with our group you save from $400 pp for an inside to $425 pp for a balcony cabin! Now is the time to reserve your cabin. Verandahs and balconies book quickly even this far out. Your deposit is 100% refundable until the final payment date of December 31, 2018, But this way you will be assured of the cabin you want if you reserve it now! Click here to view the Holland America website itinerary. Click here to see current class choices. NOTE: there will be many new classes added before final choices need to be made for this cruise. What's shown is for the current year's cruise. You don't have to be a beader to come along, any person who is into hand crafts, knitting, embroidery, hand quilting etc. is more than welcome to come along as an Artisan Companion, or if you have a bunch of UFO bead projects, bring them along instead of purchasing the Beaders Package. You'll still receive a fun goodie bag and be included in all the group activities. Remember, we only work on projects while we're at sea, so when we arrive in the ports we all go and explore! Classes are all open session, you're not trapped all day at a table, once you get started you're more than able to take your project and continue working on it in one of the many beautiful lounges and observation areas! We travelled all over the ship last time, taking advantage of the different areas from the Lido Deck by the Pool, to the Canaletto Restaurant and up to the Crows Nest! MARCH 18: Arrive in Ft. Lauderdale... I always suggest arriving at least one day early, you never know if your luggage will arrive too! Better safe than sorry since it's hard to get it after we sail. I will be looking into pre-cruise excursion ideas. So we sometimes come in two days early, so one full day in Ft. Lauderdale to sight see and possibly bead shop in advance! More later as I get time to research. MARCH 19: Ft. Lauderdale . . . Board the ship by 3pm. Meet and greet around 6 pm in the Crows Nest to start the trip off right and collect your goodie bags! Holland Americas private island. Unwind and enjoy the sun and sea or relax aboard ship. This is a free day to do as you wish. Start on your beading projects or just lounge ashore! We will be beading around the ship depending on the weather and temperature, either by the pool on the Lido Deck or up in the Crows Nest. Inside the Hudson Room if it has windows. We'll need to explore the ship to find the best places. Remember you are free to come and go all day, beading as you want, take a break anytime. Enjoy the spa, go for a swim, take in a show or a game . . . have FUN! MARCH 23: 7am - 1pm ~ Cartagena, Columbia. All ashore to see the amazing sights, then back on board to bead the afternoon away! 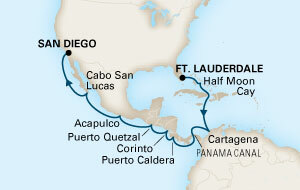 MARCH 24: 5am - 8pm ~ We'll be travelling through the Panama Canal, you'll want to be up top early for the entry. We'll spend most of the day up in the Crows Nest to bead and enjoy the transit through the canal. MARCH 25: At Sea ~ 10am - 4pm, 7pm - 11pm ~ Beading! All ashore to see the sights. Open beading after we return to the ship. All ashore. I'll be working with a local guide to arrange a private tour to some of the weavers co-ops. Or you can take the bus in and do a self tour around town. This is an interesting area with old Mayan ruins and a beautiful white sand beach. One of the tours combined the Mayan ruins, a visit to a small museum and a hike up the mountainside with a stunning view of the coastline. March 30: At Sea ~ 10am - 4pm, 7pm - 11pm ~ Beading! We did an AMAZING Extreme Zipline Tour, if we can schedule it again, we're going! It makes all the zipline tours back here in the US seem whimpy! Some of them crossed entire valleys! Others did local tours, a cooking traditional mexican and historic bus tour. April 1-2: At Sea - 10am - 4pm, 7pm - 11pm Beading! San Diego, CA ~ Time to travel home. All prices are based on double occupancy, please e-mail me for single occupancy or other cabin pricing. If you don't have a room mate and are flexible we can help you double up in a cabin. if you do not have a travel companion we will do our best to find you a room mate, but if not the single supplement would apply. The beds can be made into two singles instead of a queen. $600 deposit reserves your cabin. 100% refundable up to the final payment date of December 31, 2018. Cabin prices are subject to change as we get closer to the sailing date. Book early for the best rate! The Beaders Package is $475, this is for 5 full day classes, includes all your bead kits with complete instructions and material supplies. Fabulous goodie bag with lots of surprises! You'll have $300 credit towards kits to choose projects with. You will need to bring your basic tools based on your projects, a list will be provided upon final selections. Open Studio $175 gives you access to pre/post cruise events, and group events during the cruise. Fabulous goodie bag with lots of surprises! Ability to purchase individual kits to work on the ship along with any of your current projects and help with any projects you bring along if you get stuck! Companion / Non Beader $75 receives benefit of group rate savings of $200 - $400 per person based on cabin choice.